Today is the last day for input on the latest round of work to narrow down potential alignments for Metro’s West Santa Ana Branch Transit Corridor (WSAB) project. Metro is hosting a community meeting tonight from 6-8 p.m. in Paramount. Submit project comments in person there, or via an online comment form. See SBLA’s earlier coverage for more extensive background, but suffice it to say that the route is pretty simple south of downtown L.A., but pretty complicated through downtown. Metro is currently looking at eight different light rail (LRT) alignments downtown (see full list here or here), and none of them look easy. Seven of eight include tunnels through downtown L.A.
Metro is bending over backwards to try to stay out of the way of Little Tokyo, where folks have come out strongly against more rail construction. Metro is considering tunneling under Little Tokyo – options E or F – in part to minimize construction impacts at ground level. This drives up cost, and it seems unlikely that minimized disruption will be enough to win over Little Tokyo which already endured years of construction for the Gold Line and the Regional Connector. The Little Tokyo community would be likely to go to court to avoid another half-decade of disruption. If you can’t go through Little Tokyo, then go around, no? Metro has a light rail alternative west of Little Tokyo (option G) tunneling into the downtown core, which drives up costs and does not connect with Union Station. Metro has a light rail alternative east of Little Tokyo (option H) tunneling along the river. There are potential complications about the hydrology of tunneling along a river, though Metro’s cost ballpark for this option shows it as not quite as expensive as other tunnel options. What is most problematic about it is its utility. It’s just not very rider-friendly, because–as currently planned–it would force transfers in the Arts District (more on that below). With eight alternatives, none of which appear hugely promising, maybe it’s time to go back to the drawing board. Streetsblog S.F. editor Roger Rudick, who lived in downtown L.A.’s Little Tokyo for many years, has long pressed for another alternative: run the same heavy rail equipment used on the L.A. Red/Purple Line subway on the WSAB and connect the two lines in the Arts District. This is similar to Option H, but with no forced transfer and no tunnel. WSAB, from the rider perspective, becomes part of the subway. Not only do passengers get a one-seat ride to Union Station, but they can ride directly all the way to North Hollywood, Koreatown, and West L.A. The problem of getting through downtown is solved, since the WSAB simply connects to the end of the subway storage yards at 6th Street (see lead photo). We Streetsblog editors are not engineers or planners, but we’ve checked and double-checked this idea with some planners and engineers at Metro and elsewhere, and it appears feasible. The option was overlooked in the early days of planning on this line, because politics favored conventional L.A. standard light rail, which is narrower than the L.A. subway trains and doesn’t align with the same platforms. L.A. Light Rail also uses overhead wire, while the subway uses third rail, so the two systems are not compatible. Joining the subway with the WSAB has the potential to be a win-win-win for Metro riders, and for the communities the WSAB would serve. Where would WSAB heavy rail go? Our WSAB heavy rail proposal would run along the L.A. River, east of Little Tokyo, sharing some features of Metro’s easternmost alignment (option H). The heavy rail WSAB would extend the Red/Purple Line east out the back of Union Station into Metro’s Division 20 Metro rail yard located between the downtown L.A. Arts District and the river, south of First Street. Metro is already working to retool this yard as part of its Division 20 Portal Widening and Turnback Facility project, which lays the groundwork for an Arts District Station for the Red/Purple Line. WSAB heavy rail could extend these tracks south – all the way to Artesia. The subway tail tracks already extend south of 6th Street. Below that, the WSAB would continue south along the L.A. River along a right-of-way currently used by Amtrak to reach its shops and car-wash facility. There’s actually a pretty open ROW along this route, some portions currently used for parking lots. Where Amtrak turns east across the river near Washington Boulevard, the WSAB would continue on a flyover over the Alameda Corridor freight line at Redondo Junction, and then take an abandoned freight ROW into the city of Vernon. From there it could include a possible station in Vernon as the line continues south on an existing rail right of way between Santa Fe Avenue and Soto Street. Continuing south-southeast, the WSAB heavy rail would follow Metro’s proposed alignment. It would reach the planned Huntington Park Station at Pacific Avenue and Randolph Street and would continue along the planned WSAB alignments all the way out to the city of Artesia. Cheaper to build: No, really. By eliminating the need for boring a new ROW tunnel through downtown (and, in option F, a bridge over the 101) to reach Union Station, this should cost less than LRT. Yes, there will probably need to be a few more flyovers and a few more streets closed on the WSAB branch south of Redondo Junction, but these additional costs will be more than offset by the elimination of an all new ROW through downtown. Metro’s tunneling under 100+ year old streets downtown has meant encountering “unforeseen discoveries” leading to serious cost overruns. Unknowns and overruns would be likely on all of Metro’s latest proposals (options E, F, G, and H), all of which include significant downtown tunnels. (Another less quantifiable cost factor would be delays from lawsuits any alignment through Little Tokyo will invite). Higher capacity: Red/Purple Line heavy rail trains have quite a bit more passenger capacity than Metro light rail trains. There are lots of calculations that go into it, but Metro LRT can carry maximum loads around 14,000-19,000 passengers per hour, while Metro heavy rail maximum capacity is around 100,000+ passengers per hour. Faster: Red/Purple Line trains accelerate faster and run faster than LRT trains. The proposed eastern heavy rail alignment would be shorter and straighter than Metro’s other alternatives. These would combine to provide riders faster trip times. Potential Phasing: Initial service could potentially be brought online faster, since segments of the line could be built from the Arts District going south, and opened in increments. An early phase could consist of adding station platforms along the existing tracks in the Arts District. The trains, maintenance facilities, operators, etc. are already in place. There are big benefits for the communities along the 20-mile West Santa Ana Branch transit corridor route. The South East L.A. County cities – the Gateway Cities from Huntington Park to Artesia – would get a faster and more direct one-seat ride into Union Station, and through downtown into Red/Purple Line destinations in the Valley and on the Westside. Heavy rail would mean more capacity for ridership, especially needed to serve population-dense southeast cities. The downtown L.A. Arts District would get its (long sought-after but never quite funded) Red/Purple Line station. Instead of a limited utility dead-end spur, a WSAB Arts District station would offer community connections both north and south. Little Tokyo would avoid additional Metro construction. Heavy Rail would need longer platforms. Just because there is existing rail ROW, doesn’t mean there are no costs. But surface costs should be significantly less than underground ones. The ROW will need to be fenced in and grade crossings should probably be eliminated, as was done on Bay Area Rapid Transit (BART) in areas where it runs on the surface. This is because L.A.’s heavy-rail subway equipment is powered by third rail, which could be a potential hazard to anyone trespassing on the tracks. 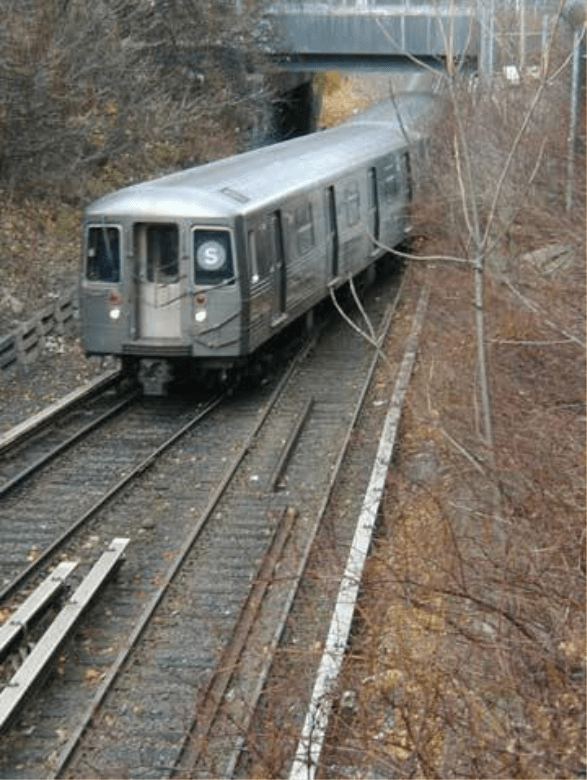 However, there’s nothing unusual about running third-rail powered, heavy rail subway trains above ground (see the example from NYC below). Longer routes (like those coming soon as part of the Regional Connector) will require logistical planning by Metro, which will likely consider running some shorter trips. This is true under any scenario, and true for all rail and bus lines. There are lots of details to work out for this proposal, and probably some unforeseen consequences. But, with Metro facing eight potentially difficult WSAB alternatives, we figured it was time to bring this idea up again and get it into the discussions. All subways run on the surface where ROW is available, just like this one in Brooklyn. Nothing unusual about it. Pantographs can be added to Subway trains delivered in the future allowing operation from overhead wire on the new line. This is done in many cities around the world, including London (Overground) and Boston (Blue Line). I’ve been saying this for years. The problem with the WSAB project is finding room through little Tokyo and in/around Union Station for a terminal station. Extending the Red/Purple would solve that problem. Fully grade separating the line in an elevated or closed alignment all the way to Artesia and building longer platforms would not be too expensive. There are some additional trade offs though…. LA’s heavy rail cannot turn as tightly as its light rail, so the route might be a little more complicated to account for wider turns. Running more cars costs more money, and unless ridership is very high, it is unlikely Metro will want to eat the operating costs of running max capacity all the way to Artesia. With anything going west of Union Station being a 6 car train, that might mean that the frequency of trains even at peak to Artesia is only every 8-12 minutes. Off peak it might be 1 train every 20 minutes. Dead of night and weekends Metro could reduce the number of cars to 2-4. Light rail would have more frequent service provided by smaller trains. -it would proclude extending a distinct WSAB like north to Glendale. -it would preclude interlining it with the blue line between Washington and slauson blvds, driving up costs. -it would eliminate the possibility of a WSAB line serving the transit desert of the fashion district and southeast historic core. Overall an idea lacking in thought. Also, I’m mystified by the obsession with reaching Union Station as some kind of end unto itself. Of course it’s a regional transit hub, but Metro Center, which option G reaches, is a bigger transit hub, and far more centrally located at that. It’s also better designed for transfers, while union station- at least until the expensive reconstruction in the far future- is a maze that takes minutes to traverse. The image from the NYC Subway is not from Queens. This is the Franklin Avenue Line in Brooklyn. The caption should be corrected. Hi from up north. Yup, that’s another option. You can chop off cars and run shorter subway trains, just as they do on the Purple Line off peak. That’s just normal train operation. Also, there aren’t any turns on the WSAB that are too tight for the subway cars that I’m aware of. -It doesn’t preclude a separate light rail extension to Glendale in any way. There are no specific service pattern reasons that there be a one seat ride from Artesia. -There is no plan to interline that section in any of the Metro schemes anyway. The WSAB is running in a viaduct over the Blue Line in the current plans. -Same answer as the first. This doesnt preclude a line through that section of downtown, and there is no reason that service would need to be a one seat ride. On your second point, it’s true that heavy rail WSAB riders wouldn’t get easy transfers to the Blue Line – but FWIW Metro wasn’t actually proposing “interlining” but was proposing doing WSAB on an elevated structure above the Blue Line. You can chop off cars, but not while a train is in service. So if the Purple/Red are running at full capacity during rush hour, either the WSAB would have to run 6 car trains as well, or the WSAB trains wouldnt be able to go to Union Station. Zev was a Westside politician who headed the opposition to the subway, but the entire County voted overwhelmingly to ban subways across LA County. The Westside was the one of most supportive areas of voting no against the ban contrary to revisionist public opinion. <> Actually, you can. And they do. The Gold Line splits trains in service at Union Station (they just make everybody get out of the car that’s getting cut). Wow…really? I didn’t even realize WSAB has gotten this insane–building an elevated LRT line over another LRT line? That’s just mind blowing. This is a great idea. The other benefit is that it could set the stage for Metro to build a rail transit line towards Downtown Pomona via the current corridor currently used by Metrolink’s Riverside Line. Remember that Metro has received multiple unsolicited proposals for private-public partnerships on this line. It might be that behind the scenes, the decision’s already been made to run this as LRT rather than HRT. Wish we could pull back the curtain and see what those proposals said… the proposals may be more influential to the Metro board than the thoughts of the general public. Interesting idea, but I worry that HRT might be overkill for that line. You only need that much capacity in very dense areas, and a lot of the line, particularly as you get farther south, isn’t super dense. Wouldn’t operating costs be higher with HRT? If the ridership isn’t there that could bleed off resources that might better be used in other ways, like more frequent bus/train service. Not only is it dense enough, it’s not true that the operating costs would be more expensive–unless Metro were running full-length trains at off hours, and there’s no reason for them to do that. Your map shows that the density drops off in the southern part of the route, just like I said. This line would have a stop by the Cerritos mall. Have you ever been to Cerritos? Let’s just say it’s not a very urban place. Even the end of the line in Artesia is basically a suburban multifamily residential and commercial area. Show me the data on operating costs. One driver per train. They are paid the same, HRT or LRT. Weight of an LRT vehicle: 42.8 tons, http://www.nipponsharyousa.com/products/pages/zlactc.htm weight of a Breda LA subway car: 80,000 lbs which equals 40 tons.https://en.wikipedia.org/wiki/Breda_A650 So why would you think there would be any difference in operating costs, unless Metro ran overly long trains? LRT trains actually have more moving parts, so I would assume maintenance costs would be a bit higher for LRT. Metro’s LRT cars are actually quite large and as high platform vehicles, end up being similar in size to the “HRT” cars found on systems like Paris, Mexico City and Montreal. And that right of way goes right to Ontario, and on to Phoenix!! Metro Center is currently a bigger transit hub because of the forced transfers from Blue and Expo riders heading downtown. But once the Regional Connector is completed it’s less clear that Metro Center will have more of a hub status than Union Station. The Expo-to-East-LA line is available at Metro Center and not Union Station, but in exchange there will be connections to Metrolink, various regional buses, Amtrak, and (some day) CAHSR. Isn’t the point of the WSAB line to take advantage of a cheap surface right-of-way over long distances of otherwise relatively suburban development? Running third-rail heavy rail seems like it negates that advantage, and would instead be a more natural fit for a more ridership-optimized right-of-way through tunnels and elevated segments in a denser urban area. SCAG did an alternatives analysis for this corridor (which also extends into Orange County) in 2012  which recommended light rail because it would have adequate capacity to serve the anticipated transit demand at a reasonable cost. Granted, they didn’t look at exactly what you are proposing, but they did consider high-speed rail options and ruled them out because of cost. I don’t have all of the answers, but it does seem to me that if you are going to propose a new alternative for this project at this late date, the burden of proof will be on you to show that it is cost effective and meets multiple objectives. In Metro’s 2017 Northern Alignment Options Study, every alternative considered is light rail . There must be a reason for that. SE LA County is denser than many people realize. Years ago, for a research project, using 2010 Census data I calculated the density of 10 incorporated cities and 4 unincorporated areas in SE county. Together they had just under 709k people with a density of over 13.k ppsm. That’s denser than Boston or Chicago or Washington, DC. And certain areas like the Pacific Boulevard retail district in Huntington Park are even denser. I think this corridor could support heavy rail. Don’t know if LRT and Red/purple trains jave difference in platform height. The platform gap can be addressed with gap filler on platform or vehicle. Am I familiar with Cerritos Mall ? I have very fond memories of my buddies and I riding my single speed bikes along the ‚ditch‘ to Cerritos Mall a couple of years after it opened. It was totally happening place for Junior High Kids to check each other out. It was a long long ride for us, but the babes were totally it. The question isn’t about rail in general, it’s about heavy rail versus light. 1. SCAG 2010 Study showed ridership of 80,000 plus for entire 34 miles to Santa Ana. Metro revised 20 mile segment shows ridership of over 80,000. In SCAG study about 60 percent of the ridership was driven from Orange County so the number today of potential ridership for entire 34 mile stretch be over 200K validating need for Heavy Rail Option. 2. Metro/SCAG projections are always low for Expo line and other lines the ridership projections are met 20 years earlier than expected. 3. Metro current Alameda underground alignment alone will cost about $2B. Metro tunneling costs are $1B per mile. $9B for 9 mile Purple Line and approx. $2Billion for 2 mile segment in Regional Connector. 4. Orange County in their latest plan has prioritized the 14 mile old Pacific Electric Right of Way which is quite wide and ultimately will connect to this 20 mile corridor. Imagine under one hour ride to either North Hollywood or Westwood with connection to green line which will finally go to LAX now with Airport People Mover. From Disney to Universal and to Airport. Most of alignment parallels I-5 which will remain clogged for ever and travel times will worsen. 5. Metro currently has only $4.7B from Measure R and M including $300Million recently secured from State grant. Spending rougly $2B in tunnel in Alameda for again 2 mile stretch and leaving the remaining 18 mile stretch at grade is going to be a huge equity issue. 7. If Built at great SELA area will never look like Downtown or Wilshire and will take away opportunity from people of color, minority and disadvantaged to access jobs, education and entertainment. 8. With the density in South East LA and OC to LA and LAX connection, this line could have potentially the highest ridership potential in United States. 9. Operation is cheaper for Heavy rail than Light Rail. 10. Throughout the World Commuter and Regional Heavy Rail system bring folks from Suburban areas to the downtown core where it swtiches to circulators, trams, streetcars and Light Rail like San Francisco BART and elsewhere whereas in LA a super slow Light Rail get you to Heavy Rail in Downtown. 11. After Regional Connector and extension of Foothill Gold Line to Montclair and Eastside Gold Line to Whittier a one seat ride to Long Beach or Santa Monica will take over 2 hours or more. Don’t know what obsession is with Light Rail but it just too slow and headways are high to make real transit solution. Most light rail is averaging around 20MPH. When we put freeways we designed them for 65 mph but we put super slow ineffective transit lines and expect people to switch to transit. Billions of taxpayer money will go to waste if these lines are not effective. A minimum of 45mph should be a standard for all rail lines. 12. I agree with another comment that a perhaps a P3 proposal is already selected and the outreach is just window dressing but voters should demand atleast investigating this option in the Environmental Document and ask Metro to provide ridership forecast for all 35 miles to see threshold for Heavy Rail. I am sure the forecast model does not capture the last two years of rapid development in Arts District and relies in zoning of city plans that are long expired. The forecast models also make very broad assumptions. Just seeing I-5 traffic will justify heavy rail and fast trips will get people out of their cars. Top 10 Prioritized Orange County corridor report includes the last segment of Pacific Electric corridor E as a Street Car connection to Santa Ana Transit Center from Westminister to Santa Ana. This seems like a very smart option. So therefore it will never happen. Though I very much want a route west of downtown via the old redline route along Glendale Blvd that I was hoping option g might somehow encourage. The bridge trains to San Francisco used third rail over the Bay Bridge but catenary on the streets. The reason for the switch was that the catenary on the bridge was higher voltage to run the interurban trains that went to Sacramento and Chico. The switch was done automatically by a mechanical trip. Metro’s proposing a $billion+ worth of tunnels “at this late date” (and those are downtown L.A. – so, if past is any indication, the costs could very well escalate) – so it felt to me like if Metro’s looking at expensive options, then Heavy Rail is one to consider. Can’t a new rail line induce future density? Consider connecting WSAB line to existing Red/Purple line at Union Station via portal turnback Div 20 project in arts districts. This will provide one-seat ride not just to Union Station but to 7th/Metro (downtown core), to North Hollywood and to UCLA (through future Purple Line section 3 project). Evaluate Option H of making WSAB a Heavy Rail line connecting to existing Red/Purple line at Union Station via Div 20 portal project in the arts district. This heavy rail would run at-grade with exclusive right-of-way similar to BART system in the bay area. This type of at-grade heavy rail will be more cost effective (vs tunneling through downtown) and could be built faster – in next 6 to 8 years. Other options of tunneling through dowtown could take many years to construct and may cost more than what Metro is currently anticipating. Expo-to-East LA line as well as Pas-LB Blueline as well as Red and Purple lines connections would be available by accommodating future growth on the north side of downtown plus direct WSAB service that would continue via deep boring underground through the fashion district, intercepting the Red/Blue lines at Pershing Square (replace the PS parking garage with a station and a city history museum) and coninue north deep under Olive, curve north after Cal Plaza and connect with the 2nd/Hope Connector station, from there proceed to Dodger Stadium where new multi-use development can take place on the northern stadium parking lots and from there to downtown Glendale, the third most populous berg in the county. This would enable riders from Glendale be able to pass through DTLA, have the choice to take a LRT train that’d go to Long Beach or to Artesia. 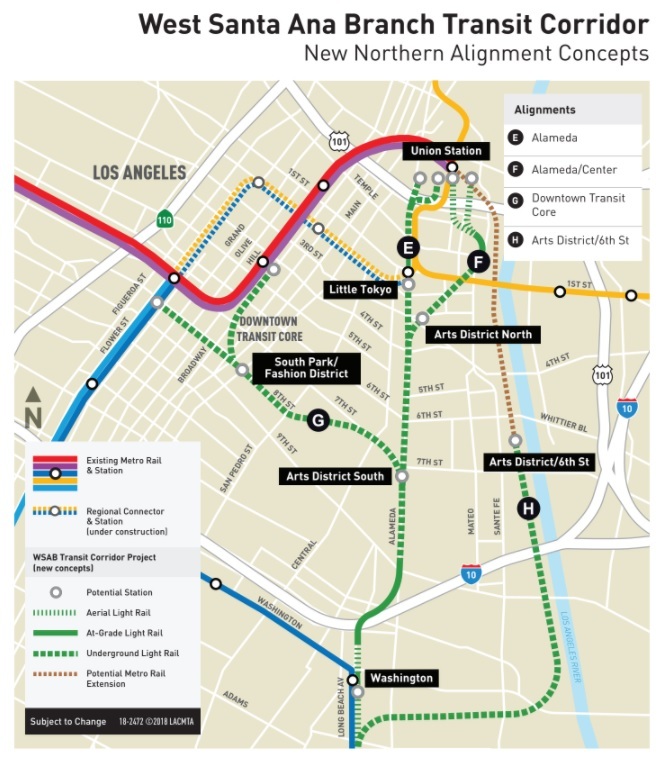 If HRT subway is an option for the Sepulveda Corridor, LRT subway had ought to be an option from the south side of DTLA northward to downtown Glendale. This subway portion would handle two lines, from Long Beach to Glendale and from Artesia to Glendale. Seems equally as sensible as the Sepulveda Corridor (whether HRT or LRT). Deep boring would preclude the cost of so much utility adjustment we’re seeing with Purple Line construction. The Metro board is planning to narrow alternatives this month. Getting through downtown L.A. is complicated. Would surface heavy rail on the West Santa Ana Branch really cost more per mile than Purple Line subway tunnels? No.